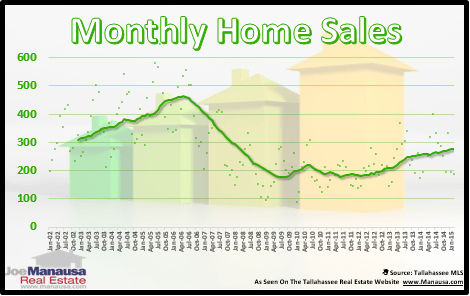 Yesterday's blog post identified a serious problem regarding demand in the housing market, so I thought I would follow-up with a silver-lining report which reveals Tallahassee home sales have risen 20% since the bottom of the housing market. This is far from a housing market recovery, but rising 20% from the bottom is certainly a step in the right direction. In the real estate graph above, we observe that Tallahassee home sales have risen 8% since this time last year, and a full 20% since August 2009 when we recorded a market bottom for the number of homes sold in Tallahassee each day. When we "zoom out" from the image seen above, the following graph can be created. 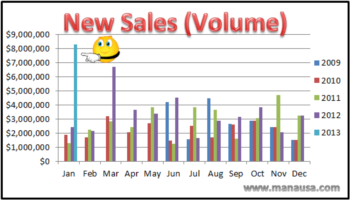 Note how the yellow gold line shows the normal amount of closed home sales each day, thus our 20% recovery is only a small portion of the growth that is needed to help restore balance between supply and demand for the homes for sale in Tallahassee. The one year trend of daily closed home sales in Tallahassee has broken the "7 homes per day" productivity level for the first time since 2010. In fact, had it not been for the Homebuyer Tax Credit in 2010, this would likely be a four-year high. This Tallahassee home sales report is positive because it shows growth from the demand side of the supply and demand imbalance. But don't let that fool you into believe that real estate appreciation is right around the corner. The increased demand is wonderful, but demand is still a far cry from the levels needed to work through the glut of homes in the forgotten inventory and shadow inventory of homes. Home values will decline for years, and smart home sellers will take the time to assess the specific market for their homes in order to establish their best plan for selling a home. 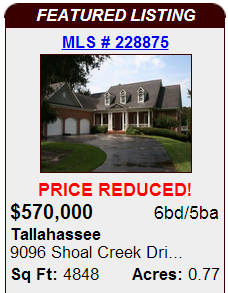 If you would like to see how a best-price analysis can put money in your pocket when you sell your home, just drop me a note and we can schedule a time to review how your specific house has been affected by recent Tallahassee home sales.